Sashi Evani is a Hyderabad based Music Promoter, Artist Manager and Musician. His company ‘livenergi’, though not more than two years old, has already organized more than 150 shows across Hyderabad and Bangalore. They have done shows for cultural centers, the government, colleges and pubs. They have discovered many musicians who are now known as some of the best in the city. ‘livenergi’ specializes in creating new sounds by putting together artists of different genres and experimenting. Their platform “Jamathon” encourages musicians of all genres and provides them a platform to showcase their skill. The Bangalore edition at Big Pitcher is listed as one of top 20 music events to watch out for. Here is OfficeChai talking with Sashi in his musical journey and his venture. Give us a background into your musical journey? How did you come to get so involved in music? Though I come from a musical family, my foray into music happened much later in life. I When I was younger, I used to consider myself to be a bit of a black sheep because I was the only one in the family with no musical skill. Or so I thought. That said, I was always passionate about music. I grew up listening to and collecting a lot of Telugu movie songs and albums. It was 1992. During my usual walk back from school I heard a really catchy song playing at a gift store. I was so mesmerized by it that I walked into the store and asked the proprietor which song it was. He showed me the album cover. The album was Khaled’s “Khaled” and the song was, yes, “Didi”. I knew I had to buy the album cassette but being a broke teenager, did not have the money to pay for it. So I assiduously saved up my pocket money for two weeks and was finally able to buy it. I played the cassette so many times that it wore out and I had to go back to the store to buy the same album again. As years passed I was getting more and more interested in music. I would listen to a host of genres and artists. But I was still just a music lover. The turning point came when a friend of mine and I were at “Turquoise Cottage”, Delhi, drinking like there was no tomorrow, listening to some crazy karaoke singing. The karaoke jockey walked up to us and asks us if we wanted to sing. As a joke, my friend suggested my name. I was never a singer. Not even a bathroom one. But the beer killed all my inhibitions (and also my common sense) and I took up the challenge. After I was done I could not believe what I saw. There was a standing ovation. The song I sang that night changed my life forever. It was “Winds of Change” by Scorpions. Every week I would learn more songs and sing them at the karaoke nights and was quickly gaining reputation as a good singer. When did you organize your first jam? There was a business networking site called “Ryze”. It was pretty popular amongst my Delhi group of friends and we used it purely for social networking. There were discussions on music in which all of us would actively participate. One day I read this post from someone who wanted to setup a jam at his place for the members of this discussion. He intended to call it “Homemade Jam”. Lot of people showed interest but none were able to take time out to take it further. I, due to my new found enthusiasm, decided to take it up and traveled for 30Kms just to jam. It was just me and the host. My host was a professional musician with over three decades of experience. I was just a music enthusiast and a karaoke singer. We came from different generations and had different musical tastes. But we ended up talking about music for the next two hours because there was one thing that we both had in common. Our passion for music. After our chat we decided to jam a bit. He started playing a song on his acoustic guitar and I sang. Halfway through the first verse we realized that we had just stumbled upon a great sound. So we put the acoustic guitar down, moved into his home studio, setup the electric guitar and microphone and jammed for the next six hours. These sessions would become a weekly ritual and we continued doing this for the next two years. The song that started it all was Rainbow’s “Temple of the King” and the musician is Sanjo, known as Sanjo the Balladeer, who became a close friend and the artist I now work very closely with. Sanjo and I started working on a lot of music together. 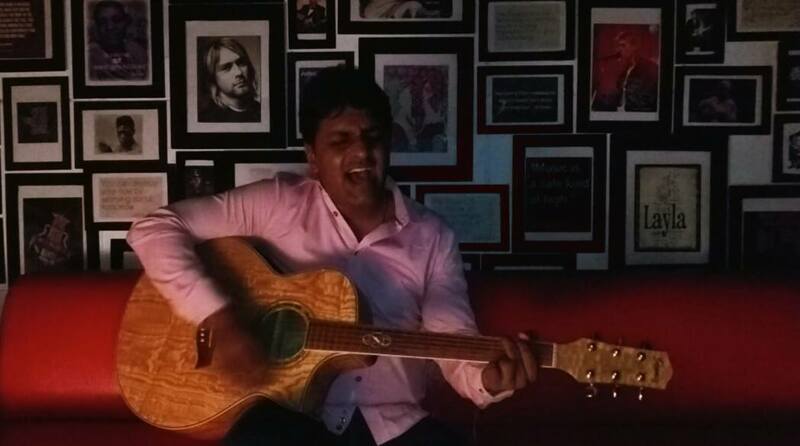 We also started a concept in Delhi which was a laidback musical evening for friends, by friends. We would invite some friends as participants and some as audience. This concept was sincerely appreciated and it also became a mainstay for years to come. Did you think Hyderabad had a potential for live music? How did you go abut exploring it? When I moved to Hyderabad six years ago, I wanted to take my music to the next level. I started organizing musical evenings at friends’ homes and invite musicians to come and jam. To my disappointment, things did not go as I thought they would and I had to shut the concept down. It was called “Jamathon”, a concept that I later revived and which is now running successfully in Bangalore and Hyderabad encouraging many established and upcoming artists and introducing them to music lovers all over. For the next few years I explored all avenues that I thought will help me connect to the music scene in Hyderabad. This included hanging out at places where bands would perform and trying to get in touch with musicians. Nothing worked and I had to give up. Some time passed and music became just a hobby. An event manager in our friends circle discovered my passion for music and the knowledge I had and asked me if I would help him manage artists. I gladly agreed. Some months later I started a music company of my own. Since then, there was no looking back. The first thing I did as a music promoter in Hyderabad was bringing “Jamathon” back to life. I have also worked with many artists and bands ever since and have done numerous commercial and non-commercial shows. What are the challenges working in this field? When a show goes well, the credit goes to the artists. If it does not, you are blamed. Bringing all the elements together. The musicians, the sound engineer etc. Last minute coordination is always a major pain. Convincing musicians to look at the big picture. A lot of them look at immediate gains and it is difficult to convince them that I have major plans for them. Best moments from your time as a band manager? There is nothing more satisfying than seeing your plan succeed. I am someone who does not rely on existing bands/groups alone. I sometimes handpick artists and group them. All this based on a sound that I visualize in my head. It is a huge reward when you see it taking shape on stage. The journey has just begun. There is a long way for me to go. A lot to achieve and a lot to contribute. It is hard work and many times feels like a thankless job. But I’m happy that I getting to what I am most passionate about and what I do best, Music.